Pigmentary glaucoma (PG) is a part of the spectrum of secondary open angle glaucomas. It is characterized by abnormal amounts of pigment deposition on the trabecular meshwork, associated with high intraocular pressure (IOP) as well as optic disc and visual field changes. The association of pigment deposition and glaucoma was first reported by Sugar in 1940. 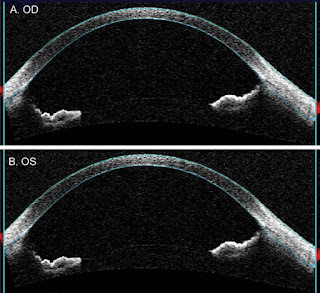 In some patients the pigment is dispersed throughout the anterior segment without any typical glaucomatous changes. This condition is called pigment dispersion syndrome (PDS). Pigment dispersion in the eye could be a part of the natural process of aging. 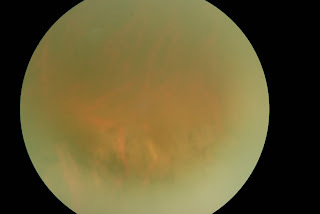 The infant eye, specially the trabecular meshwork area, is non-pigmented. However, with aging, various grades of pigmentation might become visible. PDS is characteristically seen in young myopic males in the age group of 20-40 years. The condition decreases in severity with age and may disappear later in life. The pigment dispersion can be innocuous and not cause any pathological changes in the eye. This condition as mentioned previously is known as PDS. It is characterised by pigment deposition throughout the anterior segment. This can manifest itself as the famous Krukenberg Spindles (K.S). These are the vertically oriented deposits of pigment on the corneal endothelium. K.S may vary from 1-6 mm in length and up to 3 mm in width. The typical shape of K.S is assumed to be due to the aqueous convection currents in the nasal and temporal halves of the anterior chamber. Occasionally, the pigment might be diffusely deposited on the endothelium and known as “pseudo-guttata”. K.S is not pathognomic of PDS. It can be seen in other conditions like uveitis, ocular melanomas, iris and ciliary body cysts, trauma, aging changes, exfoliation syndrome and postoperative conditions such as an intra-ocular lens chaffing on the iris. K.S is more common in females, suggesting a hormonal influence. Individuals with PDS who have K.S have been reported to have a higher conversion rate to PG. Patients with intermittent showers of pigment on exercise also have K.S more commonly. Pigment deposition might be seen on the anterior iris surface, especially within the iris furrows. In asymmetric cases, the eye with more pigment dispersion has a darker iris due to pigment deposition, giving a heterochromic appearance to the eyes. The loss of pigment leads to characteristic iris transillumination, giving rise to the appearance of the so called “church window defects”. Radial spoke like transillumination changes are commonly seen in the mid-periphery of the iris. However, in thick irises the transillumination may not be seen, therefore, the absence of these features do not rule out the diagnosis of the disease. The loss of iris pigment epithelium might be associated with dilator muscles being more hyperplastic, giving rise to a larger pupil on the more affected side. This anisocoria, heterochromia, mydriasis and a darker iris in the more affected eye can mimic congenital Horner’s syndrome in the fellow eye. 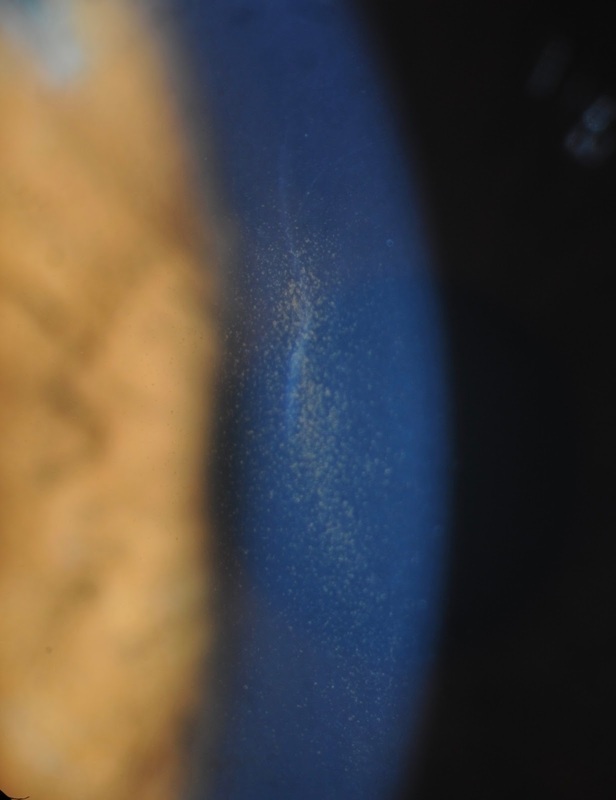 The pigment can also be deposited on the lens zonules and the anterior or posterior capsules. The accumulation of pigment at the junction of zonules and posterior capsule is called “Zentmayer Line or Scheie’s stripe”. The pigmentation in the angles is seen circumferentially; homogenously or irregularly and more prominent in the inferior trabecular meshwork due to gravity. The pigment can be deposited at Schwalbe’s line also, producing a thin, dark line resembling Sampaolesi’s line seen in psuedoexfoliation syndrome. These pigmentary changes are eponymously referred to as the “mascara line”. PG is more severe in the eye with greater degree of pigment dispersion and trabecular pigmentation. The posterior segment changes which might be seen in PDS include lattice degeneration, retinal breaks and retinal detachment. 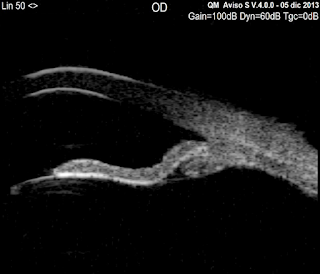 Retinal pigmentary changes have been reported in a patient. Patients of PG who undergo filtering surgery may have pigment in the filtration blebs. However, whether this pigment affects the bleb function is not known. With increasing age there is a progressive decline in the levels of pigmentation and IOP. In this so-called “burnt-out stage”, the clearing of trabecular pigmentation starts from the inferior angle, leaving a relatively darker trabecular meshwork superiorly. This is known as the “pigment reversal sign”. 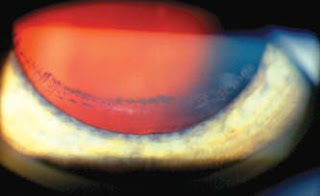 The burnt-out phase of PG appears to be due to the increasing axial length of the lens which lifts the peripheral iris away from contact with the lens-zonule bundle complexes which rub against the iris to produce pigmentation. This leads to progressive decrease in the pigment dispersion. Age related relative miosis might produce a functional iris bombe’ which may also lift the peripheral iris away from the zonular bundles. Another explanation could be that once the zonules have rubbed the entire posterior pigment epithelium of the iris, no further release is possible. Accommodation may also play a role. Being more active in young patients, it may cause increased pigment release. With aging, the accommodative power progressively decreases leading to decreased pigment release and subsequent burn-out phase of PG. An inherent weakness or degeneration of the iris pigment epithelium was proposed as the pathogenetic mechanism by Scheie and Fleischauer. Subsequent histologic studies did show iris changes such as focal atrophy and hypopigmentation, delayed melanogenesis and hyperplastic dilator muscles. Fluorescein angiography has revealed hypovascularity of the iris which could contribute to the condition. Campbell noted that the peripheral, radial loss of pigment corresponds to the location and number of anterior packets of lens zonules. Backward bowing of the peripheral iris could cause the pigment iris epithelium to rub against the zonules and release of the pigments. The backward bowing of the iris is relieved by a peripheral iridotomy which led to the concept of “reverse pupillary block”. This mechanism suggests that aqueous flows from the posterior chamber into the anterior chamber against a normal pressure gradient. This flow is enhanced by blinking and accommodation. 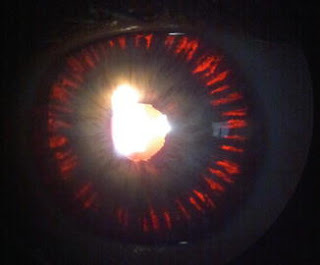 Once in the anterior chamber, the aqueous is unable to go back due to a one-way valve effect between the iris and the lens, leading to a higher pressure in the anterior chamber which causes posterior bowing of the peripheral iris. Another theory suggests that certain elongated anterior zonules encroach over the central visual axis, leading to rubbing of more central parts of the iris to these zonules. IOP becomes raised due to obstruction of the trabecular meshwork by pigment granules and cell debris. 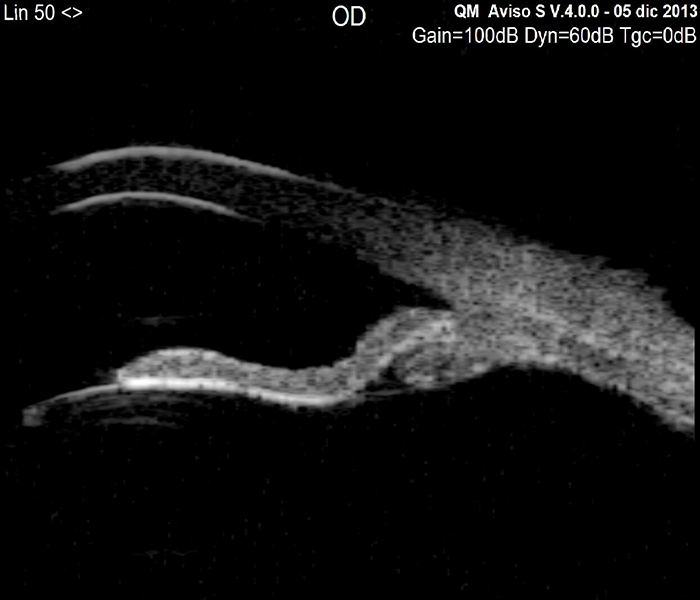 Although some congenital anterior chamber abnormalities have been seen in some patients but they are not consistent enough to suggest a role in the development of glaucoma. Pharmacologic management with pilocarpine may cause miosis and reduce the pigment shedding. However, it causes a worsening of myopia and increases the risk of retinal detachment. The alpha-adrenergic agonist thymoxamine has the advantage of producing miosis without cycloplegia. However, it is not easily available. Other classes of drugs such as beta-blockers, carbonic anhydrase inhibitors and prostaglandin analogues can control IOP but will not avoid the mechanism of pigment release. Laser iridotomy has shown to flatten the iris and reduce the pigment release. Argon and selective laser trabeculoplasty have also been effective in controlling IOP, however, their effect declines with time. In case IOP is uncontrolled by conservative means, trabeculectomy is required. Compared to primary open angle glaucoma patients, more patients with pigmentary glaucoma require surgery. Men require it more often and at an earlier age. This characteristic could be related to the anterior chamber depth. In males the anterior chamber is deeper (3.22 =/- 0.42 mm) compared to females (2.88 =/- 0.38 mm). This is related to more posterior bowing compared to females. In those patients who have exercise induced pigment release and IOP elevation, 0.5% Pilocarpine prior to exercise is helpful.